Finally, summer is here! With the sun shining and birds chirping, it’s hard to stay inside all day. Get out and enjoy the weather – it will do your mind and body good. But remember, it’s easy to wear yourself out in the warmer weather and do too much too soon, so get educated about how to have a safe, active summer. Exercise doesn’t need to seem like a chore. Join a neighborhood walking group or grab your spouse or a friend and head to the gym. Often times your local YMCA or community center will have great exercise classes for those 65+. Don’t bite off more than you can chew. Set short-term realistic goals that are attainable. Lengthening your running distance each week, upping the number of reps you do on your favorite machine or increasing the weights you lift (by no more than 10 percent each week) will create a sense of accomplishment. Even when you feel like you do not have enough energy for a full workout, go outside for a walk, hop on the treadmill for 15 minutes or simply make it a point to take the stairs when possible – every little step counts! 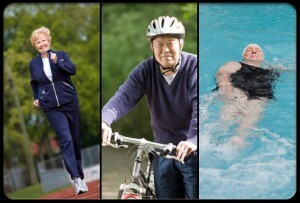 We’re not as young and athletic as we once were, but that doesn’t mean we can’t stay active and healthy. Even if you are in a wheelchair or use a walker to get around, get creative with your workouts. Try some of these chair exercises to get stronger and build muscle. It is crucial to refuel your body post-workout with a mix of carbohydrates and high quality protein. Also, remember to drink plenty of water so that you do not get dehydrated. Even being outside doing light exercise, such as gardening, can wear you out in intense heat. Do not get stuck doing the same routine each time you are heading to the gym. Try taking a class such as swim aerobics; join a summer sports league for people aged 55 or older or sign-up for a local 5K with some friends. Trying out different types of workouts will make you feel refreshed and allow you to exercise different muscles. For more summer fitness tips check out this article on Seniorific.com.